If you have a Kindle Fire and an Android phone, you may have noticed that some of the apps on your phone cannot be downloaded to the Kindle Fire from the Amazon App Store. Or, if you bought apps from the Google Play Market for your phone, you might want to use them on your Kindle Fire. Check out the video below or read on for detailed instructions. Fortunately you can “sideload” apps by installing their apk files on your Kindle Fire. This does not requiring rooting your device. Some apps work on the Kindle Fire even though they are not officially supported, but others do not. For example, some of my favorites I was unable to download directly from the Amazon App Store to my Kindle Fire were Dropbox, Business Calendar, WeatherBug Elite, Google Voice, ADW.launcher EX, and Google Maps. I attempted to sideload all of these, but Business Calendar and WeatherBug do not work. The others worked great! Install SugarSync Amazon cloud drive – it is free, supported on the Kindle Fire, and every time you want to add an application you can do it via wifi instead of needing to plug in your phone and kindle into a computer. 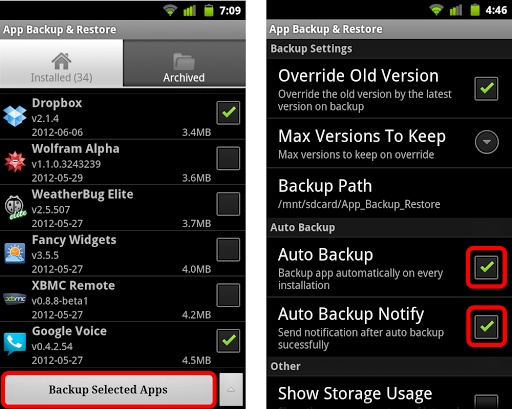 Install App Backup and Restore – it is also free and very easy to use. It will create the .apk installation files that you need to install on your Kindle Fire. Check “Auto Backup” and “Auto Backup Notify” – now the new apk files will be automatically updated on SugarSync whenever new versions are installed and you will be notified to reinstall them on your Kindle Fire. Now open the SugarSync app on your phone. Under the “My Devices” section select your phone. 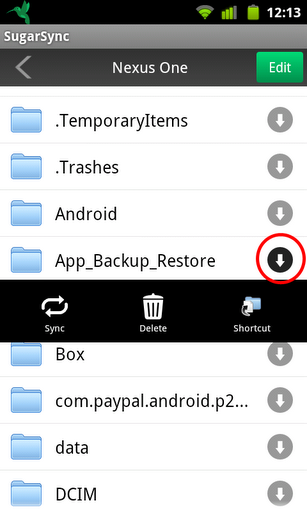 Scroll down until you find the folder “App_Backup_Restore” and tap the circle with the arrow in it on the right. Now select “Sync” and then “Yes” at the next dialog. Set aside your phone, and grab your Kindle Fire. 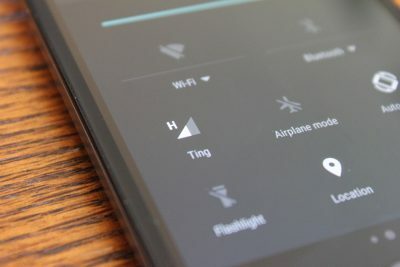 Tap the settings/wifi/battery icon in the upper right corner. 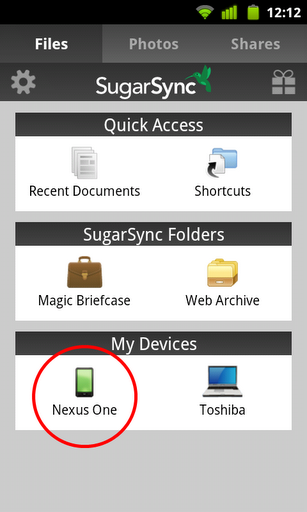 Install Sugarsync Amazon cloud drive on your Kindle Fire. 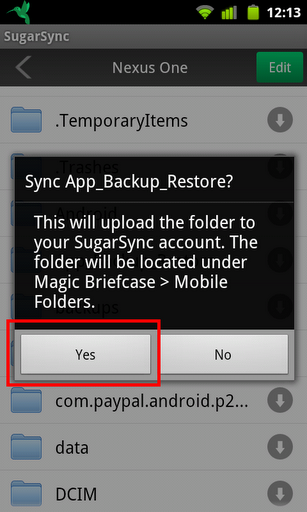 Open SugarSync and tap “Magic Briefcase” then “Mobile Folders” and finally “App_Backup_Restore” as shown below. Now select any of the APK files you uploaded – they will download and you will receive a prompt to install them. 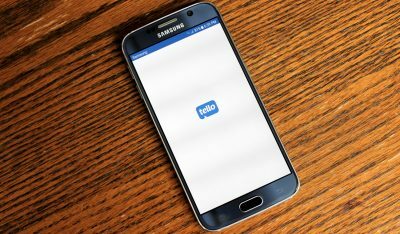 Install your apps and enjoy! Update 1: Check out my post, Top Kindle Fire Apps to Sideload, to learn about some apps you can sideload to really increase the functionality of your device. 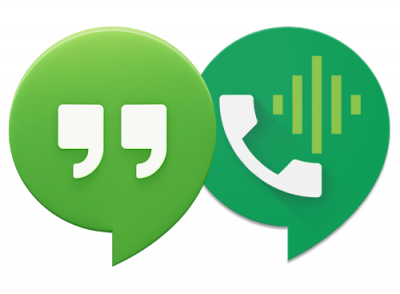 Update 2: The newer Google Voice app no longer works with the Kindle Fire. 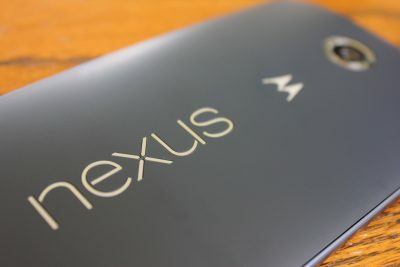 Version 0.4.2.54 works well and can be found here in the 2nd post at XDA developers.